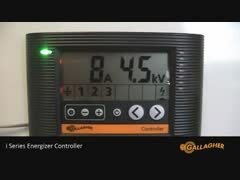 The Gallagher M2800i is an intelligent, extremely powerful fence energiser. The M2800i is suitable for multiple wire fences of up to a maximum 53 km in length. Gallagher M2800i is the most powerful of the i series energisers and like other energisers from Gallagher, the quality is unsurpassed. You can expect long-lasting reliable, high performance from the M2800i with consistent performance for example, with the "Adaptive Control" function adjusting the power as necessary, which will enable the M2800i to burn through encroaching vegetation and ensure the maximum power at the end of the fence. This is just one of many features that makes the i-series energisers the best you can buy. One uniquely convenient feature of the i-series energizers is the external display/control panel, which provides you with on-screen fence performance information from a convenient location, which can be anything up to 200m from the M2800i energiser. From this location you can not only monitor performance of the fence system, you can also operate the M2800i energiser and turn the fence on or off. An intelligent fence system that automatically adjusts power to help deal with problems. A Powerful energiser that is suitable for multiple wire fences of up to 53 km. Warranty: 3 Years (Including 1 extra year free of charge when registering online).